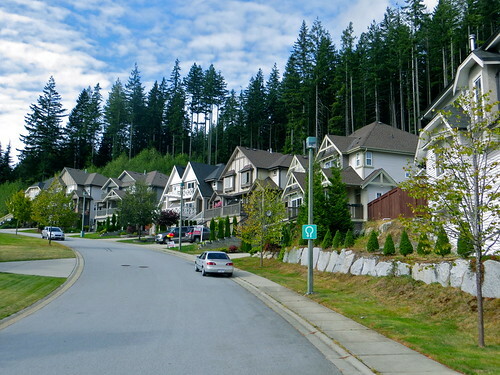 The Heritage Mountain, Twin Creeks, Noons Creek, Mountain Meadows and Heritage Woods neighbourhoods of the North Shore are relatively new, fundamentally residential and home predominantly to families with school age children. There are many neighbourhood parks in this area. Nestled along the mountainside, many homes have great views of Inlet Centre below while homes in Twin Creeks lies above Pleasantside neighbourhood near the beautiful Bert Flinn Park. This park is popular for its hiking and biking trails while Mountain Meadows Park is popular with its walking trails and sports fields. Since 2000, two new schools have opened in Port Moody to serve the needs of students primarily on the North Shore. A new middle school has now been approved for the Heritage Mountain/Anmore communities that will have a capacity of 500 students. For updated information on this project, visit New School Constructions. The neighbouring Inlet Centre provides amenities such as grocery, shops, services, restaurants and cafés for North Shore residents.